Knowing and designing the ideal customer experience journey has quickly become a critical competitive edge in an ever more fierce battle for customer acquisition and retention. Contact centers play a vital role in not just the experience journey, but also in building customer intelligence. 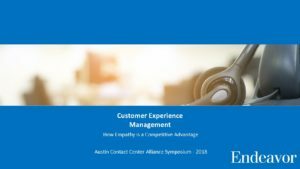 In this presentation, we review the foundations of customer experience management, provide examples of tools and resources that you can use to understand client’s experiences and address opportunities for improvement, and discuss ways that you can implement changes for lasting impact.